"Barrymore's gritty vocals set her up as a true Detroit diva...Somers provocative yet conservative guitar style is the backbone." Steve Somers Band is a six-piece band featuring vocalist Valerie Barrymore, guitarist-arranger-composer Steve Somers, bassist-vocalist Billy Wilson and also drums, keyboards and the Metro Horns. Their CDs "Blue Condition", "Steve & Val", "Crazy" and "Foundation of Funk" are now available on the Alley and B. Rox record labels at Harmony House and many independant CD stores in Michigan and Ohio. They are also available world wide through mail order and the internet(cdbaby.com and amazon.com). They have been nominated for the Motor City Music Awards two years in a row and have appeared with Bobby Bland, Denise LaSalle, Rare Earth, Contours, Morris Day, Junior Walker All Star Band and the O'Jays. For information regarding private parties and receptions please see the Services section. Listen to a sample of our music at CDbaby.com! Our first two CDs contain mostly R & B, Blues and Jazz. At private parties, we play a wide variety of quality dance music (see song list below). 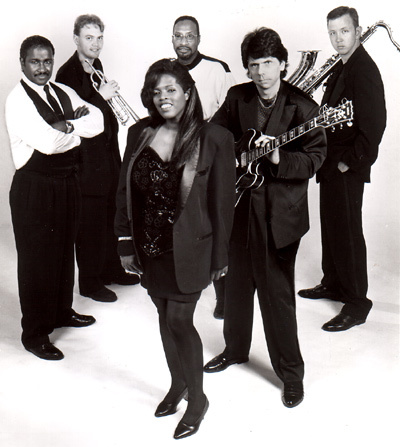 Steve, Val and the band were nominated for seven different Motor City Music Awards in 2001. These include best singer, guitarist, songwriter and band in blues, R & B and funk catagories. In 2004 Valerie received an award for best funk, urban vocalist from the Detroit Motor City Music Awards. "Steve possesses a great deal of talent and professionalism and we would recommend him to anyone." Steve Somers was born in New York City and raised in the San Francisco Bay Area. He has lived in the Detroit area since 1980 and received a masters degree in music from Eastern Michigan University in 1986. Mr. Somers has taught music at Washtenaw Community College and also privately. He has been involved with music professionally since 1977 and has been working with the Steve Somers Band for about ten years. Mr. Somers also owns and operates his own teaching and recording studio. With the Steve Somers Band he has performed at many major festivals, hotels, night clubs and resorts. Valerie Barrymore hails from Detroit and has been lead vocalist for the Steve Somers Band for four years. After attending Michigan Christian College she toured throughout the U.S., Canada and Japan. Also a talented songwriter, she penned the title track of their first C.D. "Desire". In 1999 she was nominated for best R & B vocalist in the Metro Times Motor City Music Awards. Billy Wilson supplies bass guitar parts and additional lead vocals for the Steve Somers Band. He has worked with a variety of artists including Joe Williams, James Cleveland, Martha Reeves and the Contours. Mr. Wilson is president and founder of the "Motown Alumni Association". WOW! Tina Turner and James Brown rolled into one. Awesome band, George Clinton can't hold a candle to these guys. 14-piece big band available during dinner and one dance set, specializing in Motown, R & B, classic rock and jazz styles(see list below). A 25% deposit is required. Additional (Slow, Variety, Standards etc.) When A Man Loves a Woman, Desire (original), Knockin' On Heavens Door, It Had to Be You, Misty, Dock Of The Bay, People Get Ready, Purple Rain, Let's Stay Together, Wonderful World, Wonderful Tonight, I Feel Good, Everybody (hustle song), Let's Twist, Hokey Pokey, Night Train, Satin Doll, Moon Dance, At Last, Last Kiss, Turn The Page, Get Down Tonight, What's Love Got To do With It, I Believe (original), Boy You Know (original), Crossfire, Sweet Home Chicago, Wang Dang Doodle, etc. We accept song requests.